Scope: Brigade Fire and Fury is a set of wargame rules using military miniatures, that allows players to recreate the epic battles of the American Civil War, 1861-1864. 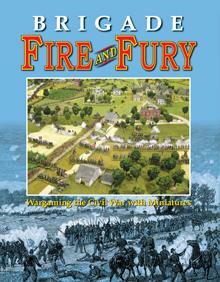 Together with its companion ruleset, Regimental Fire and Fury, which allows you to recreate smaller actions and portions of larger battles in greater detail, no historical American Civil War battle is too large or too small for the Fire and Fury game system. Scale: There are two scales used in the brigade game for troop strength per stand, number of guns per stand, distance, and time. 1" of terrain represents either 45 or 60 yards. Each game turn represents approximately 20 or 30 minutes of the battle. The tactical unit is the brigade of infantry and cavalry, and battery. Intended for 15mm figures, other scale figures can be used, by increasing or decreasing the basing and ground scales as described in the rules. Basing: The brigade game uses the same standard basing used in Regimental Fire and Fury so you can play both systems using the same miniature armies. Each 1" x 3/4" stand with 3 infantry figures, and 1" x 1" with 2 cavalry figures, represents either 150 or 200 men. Each 1" x 1-1/2" stand with a gun model and 2 or 3 figure crew represents a 6 or 8 gun battery. Brigade size can range from 2 to 25 troop stands and average 6-12 stands per unit. Each battery is represented by 1 gun stand. Status Markers: Fire and Fury revolutionized the use of modelled status markers which replaced many book-keeping chores, and improved the visual appeal of wargames by eliminating the unsightly battlefield clutter consisting of coloured pipe cleaners, gems, casualty rings, or cardboard markers prescribed by other wargame rules. Fire and Fury emphasizes tabletop beauty by marking the status of units (Disorder, low on ammunition, damaged batteries, etc.) with markers made from miniatures instead of casualty caps or cardboard chits like other wargames. The modelling of status markers has become an art form. In keeping with the Fire and Fury tradition to strive to make all the pieces on the game table look as close to a moving diorama as possible, we've introduced two new markers to represent achieving victory conditions, the key position lost marker and the heavy casualties marker. Tables & Charts: All activity is summarized on a well organized and intuitive Quick Reference Sheet, so constant reference to the rule book during play should not be necessary. Two copies are provided with the game. Players usually will find it necessary to use one or more of the tables and charts during each phase of a turn. Unlike other wargame rules, Fire and Fury eliminates the need for laborious and repetitive morale tests before and after fire combat, before and after melee, and before the start of the next turn. Instead, easily implemented, and historically descriptive maneuver and combat effects are built into the streamlined Fire and Fury tables. Unit and Leader Labels: Fire and Fury uses simple brigade identification labels like "Pickett - Armistead - E Vet 10/8/5 RM", which are easy to read and contain all relevant command and control, brigade experience and morale, its strength, weapons and leadership information for a unit. In this example, Armistead's Brigade of Pickett's Division has a full strength of 10 veteran infantry stands, and an exceptional brigade commander rating. Armistead's brigade loses its freshness bonus after losing 2 stands, and it is considered spent once its strength has dropped to 5 stands. There are two methods from which to choose for the preparation and placement of labels.The first method, used in the original Fire and Fury game, is a small, handwritten, adhesive label attached to the underside of the brigade command stand, where it does not spoil the "moving diorama" look of a miniatures game, but require players constantly to look at the bottom of the stand to read the information, which can slow the game play. The second method is far easier to use during a game because the labels will be visible. The order of battle provided with each scenario in the rulebook, and future scenario books, can be photocopied and used for making labels. After some experimenting, these white type on a black background labels are relatively unobtrusive, and can be adhered to a stand in the rear row of the formation so players have an unobstructed view of it, and always placed to the far right to mark one end of the formation, where it can be easily referred to when a brigade needs to pass a maneuver or charge combat tests. Unit Ratings: A higher granularity for rating units has been ported over from Regimental Fire and Fury and adjusted for brigade-sized units. Each brigade and battery must be assigned one of four combat experience ratings: crack (very good), veteran (good), experienced (average), and green (poor). Each brigade also has three effectiveness levels: fresh, worn, and spent. To determine how fast a unit drops from fresh to worn and then spent, the brigade is assigned one of three morale levels: spirited (high morale), reliable (average), unreliable (low), and dispirited (very low). Game Turn Sequence. A game turn is divided into an alternating Union and Confederate player turns. Players must follow the Player Turn Sequence. Each player turn consists of three phases. One phase must be completed before moving to the next. Some activities in a phase are performed by the opposing player or jointly by both players. Maneuver Phase - In the first phase of a player turn the player must resolve a maneuver check for each brigade which he controls on the game table. The maneuver check combines the elements in warfare of morale, command and control into a single die roll procedure using a redesigned Maneuver Table. The effects from the table describe the movement and other maneuvers that each unit is allowed or required to perform in this phase. In a scenario where cavalry is present, the opposing player may perform countercharges in this phase. Musketry and Cannonade Phase - All fire combat is resolved in the second phase of the player turn. Both Union and Confederate units may fire during this phase. The phase consists of two rounds of fire combat. It begins with a round of defensive fire followed by a round of offensive fire. In the Confederate player turn only Union units may defensive fire, and only Confederate units may offensive fire. During the Union player turn the order is reversed with Confederate defensive fire followed by Union offensive fire. All fire combat is resolved using a redesigned Musketry & Cannonade Table to determine casualties and other combat effects. Charge Phase - In the third and final phase of a player turn, charge combat must be resolved wherever a charging unit made contact with the enemy. The relative position between attacking and defending units will determine which combats need to be divided into less complex combat situations. Both sides then follow a joint die roll procedure to resolve a round of charge combat. A detailed Charge Table is used to determine casualties and other combat effects. Depending on the results of the first round of combat, a second round of breakthrough charge combat may follow after all first round combats are resolved. The current player turn ends after all charge combat is resolved and the next player turn begins. Battle Scenarios: The rulebook offers three historical battle scenarios covering different periods of the war. Battle of First Bull Run - 21JUL1861 - The first major battle in the East. First Day Battle of Gettysburg - 1JUL1863 - The opening phase of a pivotal mid-war battle. The Battle of Reams Station - 25AUG1864 - A battle during the late-war Petersburg Campaign. These scenarios were extensively researched to bring rich, accurate, and historical detail to the table top. We believe playing a Brigade Fire and Fury historical scenario can serve as a teaching tool for those seeking to learn more about the battles of the nation's greatest conflict. Historical battles do not always make for an evenly balanced game, so the special scenario rules and victory conditions are sometimes adjusted to give either side a chance for victory. We are currently designing and playtesting more battles to be published in future scenario books.